About a month ago, Ron from Pen Chalet contacted me to ask if I’d be interested in receiving a pen for review. I happily accepted, and after a bit of back and forth, he agreed to send me a Monteverde Prima with a 1.1 mm stub nib. I’d heard good things about Monteverde, and my only experience with stub nibs was with the wider 1.9 mm nib on my Lamy Joy pen. It was a gap in my collection, and, having recently renewed my interest in calligraphy, I thought it made sense to do a bit of exploration. It only took a day before I was looking for words that were fun to write. Words with Ms and Ns, like “mnemonic.” Words with Ps and Qs, like “opaque.” Rs were rewarding, Ts divine, and Vs delectable. “Monteverde” itself was a joy to write. I found myself avoiding words with Fs, though – I still haven’t found a version of F that I’m happy with. At any rate, the Monteverde Prima comes in a green leatherette-ish box, which is embossed on the top with the Monteverde logo. 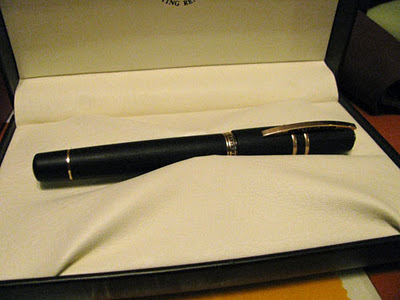 Inside, the pen rests on a white satin bed and is held in place by a satin ribbon. In the bottom of the box, underneath the bed, are a set of instructions and a cartridge. It’s a nice presentation, especially considering the very reasonable cost of the pen, but it’s nothing especially luxurious. The pen itself, though, is lovely. The cap and barrel are made from a glossy acrylic resin and are nicely framed by chrome trim. The resin comes in five varieties, each of which consists of a base color with an accent color swirled in, creating a marbled look: black with a yellow-green swirl, green with a black swirl, tiger eye (which is an amber-orange) with black, purple with white, and turquoise with both black and white. The black swirl is by far the most conservative, followed by the tiger eye, while the green, purple, and turquoise are all quite vibrant. On all of the models, the very bottom of the barrel, the very top of the cap, and the grip are all solid, glossy black. The Prima measures 5.25 inches in length, and weighs in at 1 ounce. By comparison, the Visconti Homo Sapiens, which a fairly hefty pen, weighs in at 1.6 oz, and the Pelikan M205, which feels nearly insubstantial by comparison, weighs in at only 0.4 oz. The Prima is a nice compromise between the two extremes, as it feels quite solid and well balanced in the hand. I don’t typically post my cap, so I won’t claim to be an authority on how it feels posted, other than very secure. My one complaint about the construction of the pen is the clip. It is very tight and has no spring to it, so it’s actually a bit tough to get in and out of a suit pocket. Monteverde offers the Prima with a fine, medium, broad, or 1.1 mm stub nib. My review unit came equipped with the stub nib, and I’m pleased to report that it is a joy to write with straight out of the box. It needed no adjustment to work optimally, though I did make sure to clean all of the parts first. The stub nib takes a little bit of technique to get the most out of – primarily hand position. The results, lovely line variation, are worth it, though; it simply becomes fun to write. One does have to be concerned about ink flow with a stub nib – the feed has to be able to keep up with the amount of ink laid down by the nib. Happily, the Prima does the job. 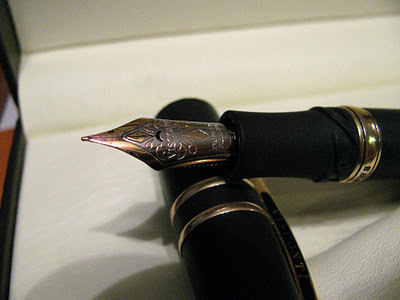 While the pen occasionally takes two strokes to get started, usually after being left for a while, it generally starts on the second stroke without issue. It is not a wet writer, though – it just keeps up. I tested the pen with both J. Herbin Bleu Myosotis and Noodler’s Black Swan in Australian Roses, both of which typically exhibit a high degree of shading. With the stub nib, though, they both produced a consistent, solid line. I wouldn’t describe it a dry writer – there was no scratchiness in evidence, for example – it does produce a very measured line, which diminishes the amount of shading one would normally see with either ink. This is not a problem with either the pen or the ink so far as I can tell, but it is a behavior that one should be aware of. Overall, I’m very happy with the Monteverde Prima. I haven’t had experience with any of their other pens or nibs, but I’m certainly going to explore, given my experience with this one. The Monteverde Prima lists for US$70.00, but it can be found for less at many fine retailers, including Pen Chalet. Pen Chalet graciously provided this pen for review purposes. Platinum Carbon is archival-quality ink that I've reviewed favorably in the past. I've reviewed other permanent inks as well, but Carbon stands out for its ability to completely withstand water once dry, making it very friendly to artists who want to paint with washes or watercolors over inked lines. Most other permanent inks permanently stain the page, but leave a residue that can be smeared or tint the color of the wash.
To understand the behavior of Carbon ink, it is useful to discuss the difference between dyes and pigments. Generally speaking, dye is a soluble substance that chemically bonds to the substrate that it is coloring. Because they are soluble, many dyes can be washed off easily, and must be fixed in place using other substances. Since the vast majority of fountain pen inks are dye based, finding ones with water resistance is hard to come by. There are a few dye-based inks that are waterproof, though, by becoming insoluble once they bond with the cellulose in paper. Noodler's "bulletproof" inks are notable examples. The trouble with these inks is that any dye that dries on top of the paper, as previously mentioned, remains vulnerable to moisture – it can be smudged, smeared, and washed away. Pigment, on the other hand, is an insoluble, particulate substance that physically adheres to the substrate it colors. It is typically added to a medium, a neutral substance that allows it to be easily applied, which often contains a binder, a substance that aids in adhesion, to create a suspension. Oil and acrylic paints, printer's and India ink are all examples of pigment-based colorants. 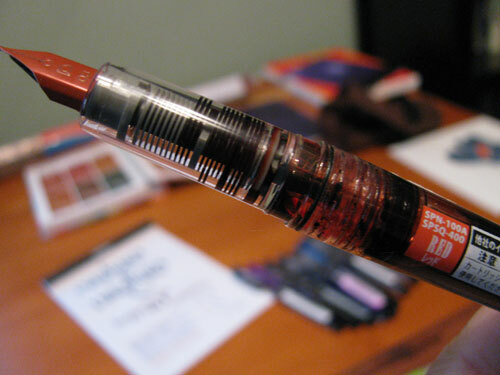 Traditionally, pigment-based inks are unsuitable for fountain pen use. The medium is often too viscous and the particles too large to be carried by the delicate capillary action that powers the flow of ink in a fountain pen. 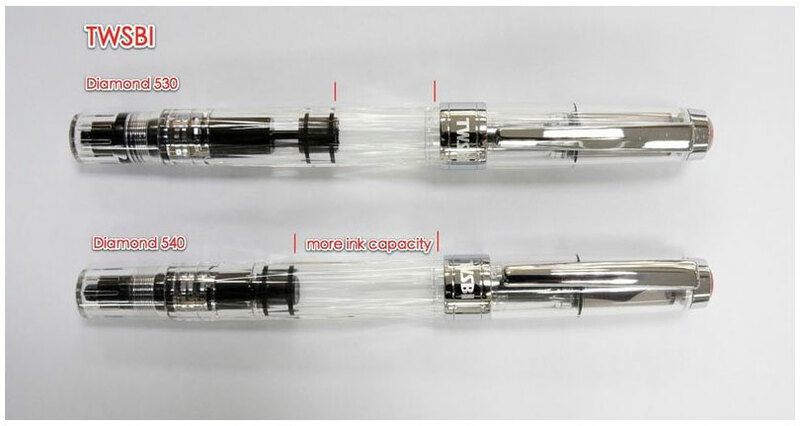 Carbon ink solves this problem by using micro-particles that are suspended in a medium friendly to fountain pens. The micro-particles are small enough to flow through the feed and nib, and the medium is engineered not to clog. However, if the ink were to dry out in the pen, the insoluble nature of the pigment would make it very hard to clean out. It would require disassembly of the pen at the very least, whereas most dye-based inks could be flushed out with some effort. Unfortunately, this characteristic makes many fountain pen users wary of using the ink. Everyone has had or will have a pen dry out on them at some point, and no one wants to ruin their favorite pen when it happens. Enter the Platinum Carbon Desk Pen. Designed for sitting on top of one's desk, and not for carrying around in one's pocket, this inexpensive pen is dedicated to the task of writing with Carbon ink. Now you can write with Carbon ink to your heart's content, and if the worst should happen, you can simply buy another. The pen is made of glossy black resin and has the Platinum logo and the words "Carbon Pen" embossed on the side in gold ink. It ships with a single Carbon ink cartridge, but will also accept a converter, which is available separately. The cap is a friction fit – it does not click or screw into place – but it does have a hexagonal section that prevents the pen from rolling around when capped. While the pen looks and feels solid, and isn't intended to be disposable, it is clearly not a luxury pen. Fortunately, the pen is lovely to use. It has a very long barrel, like a Lamy Joy or Pelikan Script calligraphy pen, which makes it easy to hold and well balanced in the hand. The barrel tapers to a point at the end, so the cap can't be posted. The grip section is also glossy black resin, so those with sweaty hands might find it to be slippery, but I didn't have any issues. Everything I've described so far is good – there are no showstoppers – but nothing to recommend rushing out and purchasing one. The gold-plated, steel nib, on the other hand, is phenomenal. The model I tested has a "super-fine" nib, which produces the slimmest line I've ever seen produced by a pen. At any rate, a nib this fine has no business being this smooth. It has a bit of spring to it, which gives it a cushioned feel on the page. Additionally, you can coax a tiny bit of line variation with gentle pressure, due to the springiness; it is not a flex nib – to be clear, just one with a bit of give. The super-fine nib produces an extremely slender line, as you can see in the sample above. The super-fine line would be perfect for writing complex ideograms with, which I suppose is the point. With many types of ink, a line this fine would look washed out, but the Carbon ink is up to the task. While clearly not as bold as the extra-fine line created by the Lamy, it's still a solid black on the page. I was also happy to find that the feed exhibited no trouble supplying ink to the super fine nib. I've had other extra-fine pens that wrote dry, but this one writes along with no trouble. At $13.50, the Platinum Carbon Desk Pen is a great value for the money – especially if you're interested in using Carbon ink, but don't want to risk a more expensive pen. If you find yourself hooked, you can even buy a desk pen stand made specifically for the pen. I'd like to thank Jet Pens for providing the pen for review purposes. Jet Pens made a name for themselves by importing pens, pencils, inks, paper, and other writing accessories from Japan. While their selection of products has expanded to include brands from other countries, high-quality Japanese products still remain their focus. Their customer service is top notch, and I've had them linked as an Ink Retailer that I trust for quite some time. Review notes: the writing sample was created with a Platinum Carbon Desk Pen with super-fine steel nib and a Lamy Safari with an extra-fine steel both using Carbon ink. The paper is bright white Rhodia 80gsm. Let me start by stating that the Visconti Homo Sapiens is the nicest pen I own, hands down. It's been on my "to covet" list for a while, and I decided to treat myself recently, as a reward for a promotion at work. The body is constructed from a dense black material that is a combination of basaltic lava and resin. It is slightly hygroscopic, meaning that it will absorb a light amount of moisture, and it's easy to grip, so it's a pleasure to hold for longer writing sessions. The trim, including the spring-loaded clip, is constructed entirely from solid bronze, and appears to be developing a lovely patina as the days wear on. While the pen comes packed with a cleaning cloth for the bronze, I don't envision myself using it any time soon. The Homo Sapiens comes with a new 23k palladium "dream touch" nib, which is available in EF, F, M, B, BB, and Stub widths. I purchased the EF nib, which is apparently considered a specialty item, so you may not be able to find it at all retailers. Unfortunately, I ran into trouble with the nib when I first got the pen. When I pulled it out of the box for the first time, I noticed that the nib and feed were misaligned. It wrote, but the pen was fairly dry, was a bit of a hard starter, and felt scratchy, due to a lack of lubrication from the ink. Goldspot Pens, who I ordered the pen from, arranged for me to send it back to the distributor for a nib swap. They would have done it themselves, but since the EF nib is considered a specialty item, they didn't have any spares in-house. When I got the pen back from the distributor, I was dismayed - it looked like the nib and feed were still slightly misaligned. I inked it up to test it, and was immediately relieved. Yes, the alignment still appears to be slightly off, but now the pen writes like a dream (living up to the "dream touch" moniker). It has become a wet writer, and it simply glides across the surface of the page. On Rhodia paper, the EF nib produces a line very similar to the gold EF nib on my Lamy 2000. However, the extra ink it puts down results in a much darker line; both writing samples above were written with Diamine Imperial Purple, and the Visconti is clearly darker. On more absorbent papers, like that in a Moleskine cahier, the line ends up being somewhat thicker - acting more like a fine nib. The Homo Sapiens uses a vacuum power filler that's made from titanium. While I have heard other people complain that it doesn't draw much ink, I haven't had any trouble with it. It is definitely a bit trickier to get the maximum fill from this pen than one with a piston fill mechanism, but once you get the hang of it, it works quite well. At 5.75 inches, the Visconti is just a bit longer than a Lamy Safari (or an Al-Star, pictured here). However, it is quite a bit heavier, weighing in at 1.6 ounces - a full ounce heavier than the Safari. Those that prefer their pens light may want to test drive one before purchasing. The cap is heavy enough that it does not lend itself to posting, but at 5.625 inches long unposted, I can hold it comfortably in my gorilla-sized hands. I can certainly see why the Homo Sapiens received a number of pen of the year accolades for 2010. It's a beautiful, elegant, and well-crafted pen. It took a little bit of effort to get the nib tuned right, but it was worth the effort. It was worth every penny of the $595.00 it cost. I can highly recommend it for those who are looking for a high-end fountain pen. 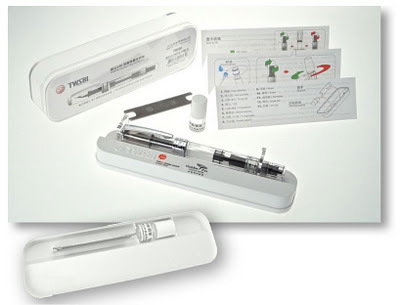 Many excellent things have been written about the TWSBI Diamond 530. 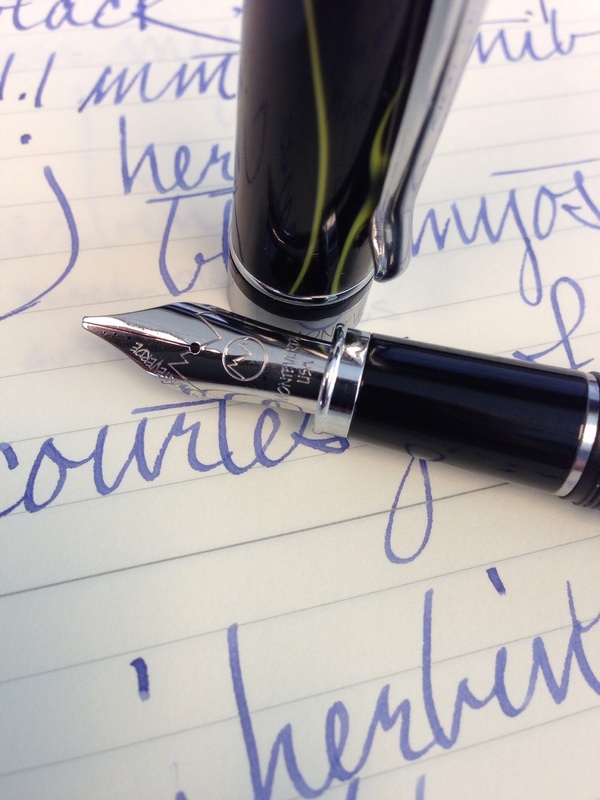 A clear, piston-fill, steel-nib demonstrator available for US$40, it was one of the best pens in its price range. It was also constructed to be completely user-serviceable -- it came with instructions on disassembly and reassembly, along with a tub of silicone grease and a purpose-built wrench for removing the piston. I used my 530 extensively - it was a workhorse of a pen that I could have easily held onto for years. 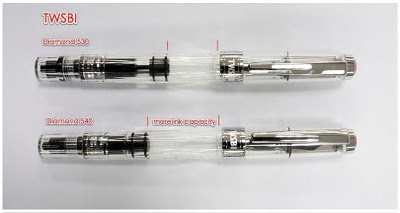 That is, until TWSBI came out with its successor, the Diamond 540. Despite being a well engineered pen that featured a great design, the 530 had two minor issues that kept it from being a classic: the threading on the cap was very tight -- enough so that to remove and replace the cap took more effort than one would expect; the piston was likewise stiff, and would occasionally stick -- I would worry that I was going to damage the mechanism when filling it with ink. I'm pleased to report that the 540 fixes both of those problems. The cap still feels secure on the pen, but it now twists on and off with ease. The piston was also fixed. Now it moves through its entire range of motion without issue. Additionally, they've increased the ink capacity of the pen to a notable degree. The pen almost holds a full 2 ml at capacity. The steel EF nib is the same one that shipped with the 530 -- in fact, the nib units are interchangeable and available from TWSBI separately. It's a stiff nail, so there is neither flex nor spring, but it does write smoothly and reliably. It's an easy starter, and can take being uncapped for a few minutes without much issue. While the price has gone up by $10 over the 530, it is still an excellent value at this price point. The only improvements I could suggest now would be a spring-loaded clip and the option for a gold nib - both things I would only expect on a pen costing twice as much. I can't recommend the Diamond 540 enough. It's one of the best values for its price, and nearly rivals pens costing more than twice as much. After a year or so of doing pen and ink reviews, I decided that I needed to establish a set of reference inks - those inks that I would use to evaluate others against. Once I picked out the colors, I then decided that it would be nice to have pens that I could keep inked wit these reference colors that, presumably, I would be using all of the time. Enter the Platinum Preppy. The Preppy is a budget-level fountain pen with above-budget level price. 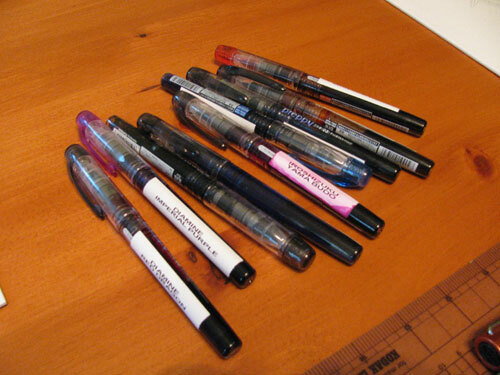 The first one I owned was a de-labeled one that came with a bottle of Noodler's Kung-Te Cheng ink. It had been converted into an eyedropper-filled pen with an o-ring a bit of silicone grease and functioned as one of the coolest looking demonstrator pens that one could find. Each converted Preppy holds upwards of 3 ml of ink - a prodigious amount. I figured that doing something similar would be a great way to have each of my reference inks close at hand without breaking the bank. A little bit of googling revealed that, with the right materials, the process of converting a Preppy into an eyedropper-filled pen is extremely straightforward. Brian Goulet, of the Goulet Pen Company, has an excellent instructional video on how to convert your own, for those that are curious. So, feeling confident, I ordered ten or so Preppys plus the neccessary ingredients, and then proceeded to convert them. The process was quick and easy, and I was quite happy with the result - a handful of pens filled with a rainbow of fruit flavors. Then I hit a creative drought, and the pens sat on the shelf for a good six months without being touched. This is every fountain pen owner's worst nightmare. Would the ink have dried in the nib? Would the pens be unusable? Could I get them to write, but be faced with hard starts, skipping, and the other consequences of gross pen abuse? I'm pleased to report that every single one of them picked up and wrote flawlessly. After six months of inactivity, the converted Preppy pens started and wrote without a problem. Platinum has engineered an extremely hardy pen. There are drawbacks to the Preppy, of course - after all, it is a budget pen. At $3-4 you are not getting a gold nib that glides across the page with no effort. The nib is steel and, though it has a tiny bit of give, it is not terribly smooth. The rest of the pen is clear plastic that looks very cool filled with ink, but otherwise has a "school children's pen case" feel to it. Yet, the Preppy is one of the few pens that it easy to take apart and thoroughly clean. When you do run into trouble - say with the previously mentioned Noodler's Kung Te-Cheng-filled pen sitting around with the cap not fully closed (even though you thought it was), and the ink does dry in the feed - it is possible to completely wash out the pen and return it to its original state. The Preppy is a workhorse of a pen, and one that you shouldn't be afraid to experiment with. It's neither glamorous nor engineered to be cradled gently in one's hand, but it is otherwise an excellent buy. I'd recommend it, especially for those looking to have a little fun with their pen collection.